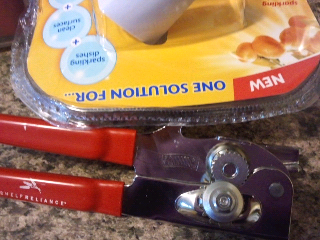 My Pinterest test for today is opening a package with a can opener. I had to get a new Lysol No Touch soap dispenser to replace my old one. I figured it would be a good chance to try this tip I had pinned. My can open, which is a SwingAway brand and very heavy duty, simply made little marks all along the edge of the package. It never once cut through the plastic. Perhaps the lip on this plastic was too big. Maybe it will work on other packages. But for today, this Pinterest tip did not work. I'll try again on another package and see what happens. Let me know if you have any luck.